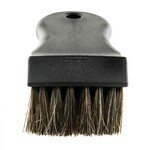 The Premium Select Horse Hair Interior Cleaning Brush is the ideal detailing tool for sensitive automobile surfaces. Fine grain leather upholstery and fabric convertible tops lose their luster once soiled with dirt, grease, or grime. Use the gentle touch of premium long-cut genuine horsehair to scrub, agitate, and remove offending contaminants from any fine upholstery inside, or outside the automobile. Chemical Guys built the Premium Select Horse Hair Brush with dozens of tufts of dense-packed long-cut horsehair bristles anchored into a durable synthetic handle. 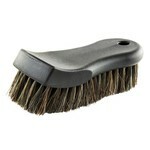 Real horsehair is renowned for its soft gentle touch with tough cleaning power. The soft hairs scrub and break down stains and loosen dirt and grime, but are gentle enough to not damage any sensitive surfaces. The sculpted plastic handle is formed for powerful scrubbing power with every stroke, and made with durable chemical and impact-resistant composite plastics. Keep one for sensitive leather hides inside the vehicle, and one for tough exterior parts like convertible tops and tonneau covers. Pair the Premium Select Horse Hair Brush with your favorite Chemical Guys cleaner and degreaser, such as Leather Cleaner, Convertible Top Cleaner, NONSENSE All Purpose Cleaner, or InnerClean Interior Quick Detail Spray. Choose the Premium Select Horse Hair Interior Cleaning Brush when nothing else will do for fine leather upholstery, fabrics, synthetics, and natural fibers. 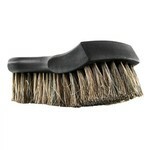 The fine horsehair used in brushes comes from the animal 's flowing manes and swishing tails. Everyone from painters, to cleaners, and detailers love horsehair for its amazing absorbency and high capacity for holding liquids. One dip into the paint can or spray of preferred cleaner soaks into the bristles and spreads on and on over the workpiece, requiring fewer trips for more product. 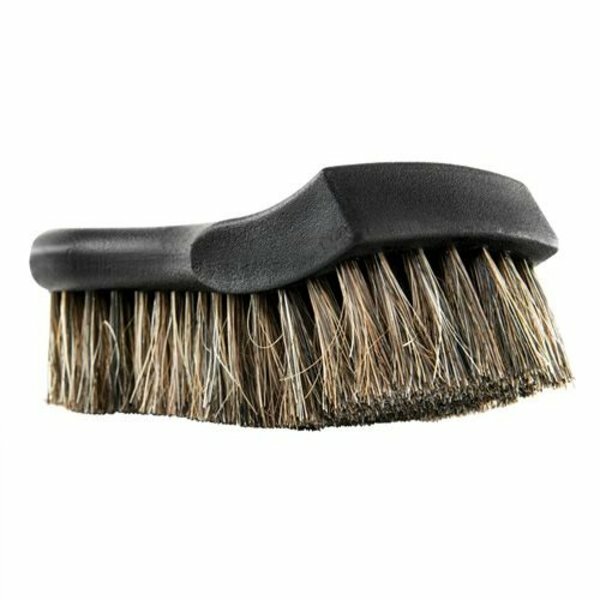 The soft horse hair used in the Premium Select Horse Hair Interior Cleaning Brush is packed densely into dozens of tight bundles, then anchored securely into the solid composite handle. This tight bond ensures the scrubbing bristles do not pull out under repeated use and scrubbing for years of dependable use. Gently scrub fine leather surfaces, tough fabric convertible tops, and even canvas and synthetic parts like tonneau covers without any fear of scratching, scarring, or damaging any sensitive pieces. 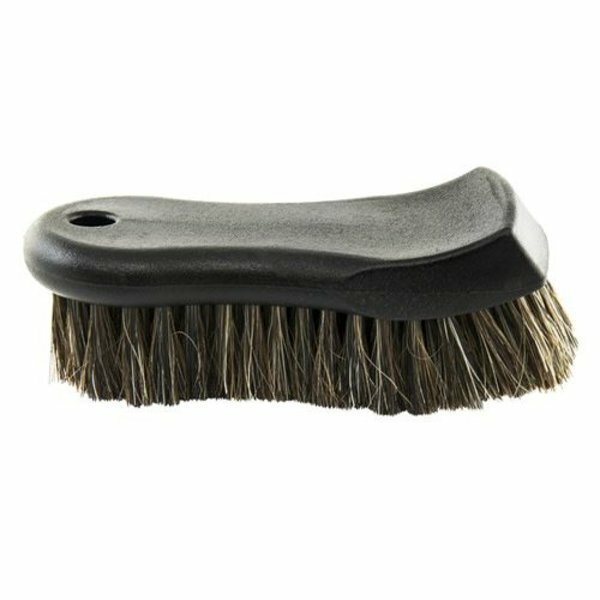 Pick up the Premium Select Horse Hair Detailing Brush for use on any fine show car, soft top beach cruiser, or dirty daily driver that needs fine detailing work inside, and out. 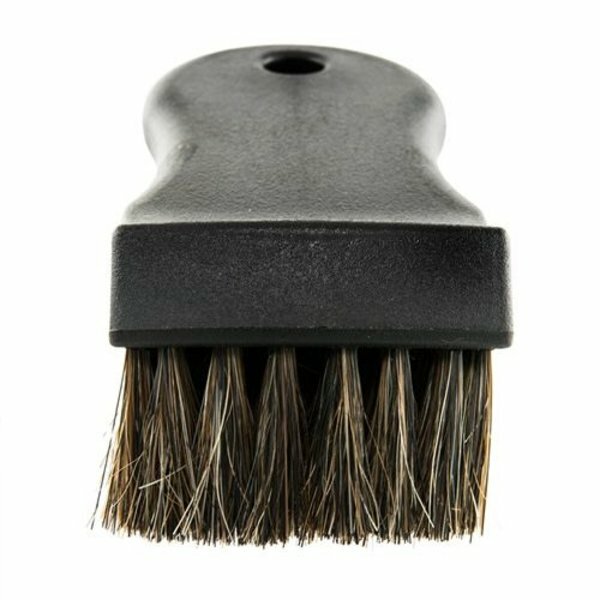 The Premium Select Horse Hair Horse Hair Interior Cleaning Brush is the ideal tool for cleaning automobile upholstery and soft tops. Because convertible tops require specialty cleaning products and procedures, Chemical Guys developed the Premium Select Detailing Brush for the most sensitive applications on cars new and old. Mist Chemical Guys Convertible Top Cleaner directly into the brush bristles or over the dirty fabric top, then scrub back and forth to agitate dirt and debris and break down set-in spots and stains. Wipe off the tainted residue with a premium microfiber towel, and inspect the work to ensure complete and thorough cleaning results. Keep one Premium Select Brush for exterior fabrics on convertible tops and tonneau covers, and one for interior surfaces like leather and vinyl upholstery on seats, door panels, and dashboards. The Premium Select Horse Hair Brush is soft enough to gently refresh any well-maintained top, but tough enough to reverse years of dirt and grime to help restore a like-new appearance. Professionals, car detailers, show car enthusiasts, and people in the know choose the Premium Select Horse Hair Detailing Brush from Chemical Guys whenever they need a show-stopping finish. Chemical Guys brushes and accessories are made from the highest quality materials and with the most advanced manufacturing techniques. The Premium Select Horse Hair Detailing Brush is made with genuine horse hair for tough scrubbing that doesn 't harm sensitive fabrics and surfaces. The injection-molded plastic handle is practically indestructible, and lasts for years of detailing use. The dense-packed bundles of Horse hair bristles are firmly anchored down into the rugged plastic handle, and literally refuse to pull out when the pressure is on. Pick up your own Premium Select Horse Hair Detailing Brush, and you 'll see why professional detailers and show car preppers choose Chemical Guys products, accessories, and tools for their handicraft. 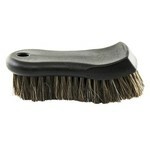 Use the Premium Select Horse Hair Detailing Brush with premium quality Chemical Guys detailing products. Detailers love the thorough cleaning abilities of Convertible Top Cleaner, the gentle touch of Leather Cleaner, and the focused stain busting power of Lightning Fast Stain Extractor. Follow up any cleaning job with the complementary protectant, like Convertible Top Protectant, Leather Serum, or Fabric Guard to keep your end results looking fresh and clean for as long as possible. It all starts with good prep, though, and the Premium Select Horse Hair Detailing Brush is the detailer 's go-to brush for fine detailing work. How To Use:For best results, avoid paintwork, dirty wheels and tires, and greasy engine components; only clean leather and synthetic leather seats and upholstery with the Premium Select Horse Hair Interior Cleaning Brush. Use the Premium Select Cleaning Brush with Chemical Guys detailing products, such as Leather Cleaner, NONSENSE All Purpose Cleaner, or Sprayable Leather Cleaner & Conditioner. Scrub natural and synthetic leather parts well, wipe off residue, then treat them with Chemical Guys Leather Conditioner and Leather Serum for enhanced look and UV protection.